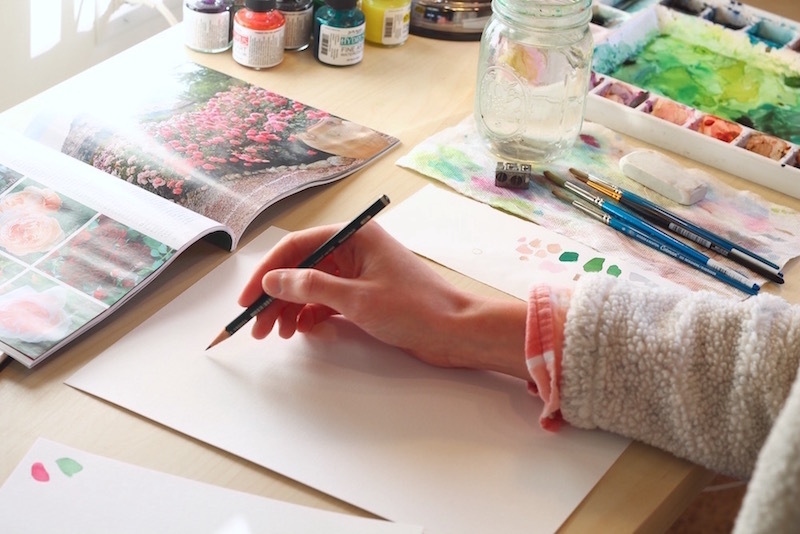 Step 1: Draw a circle and rough sketch of the flowers. Draw lightly and loosely. Feel free to trace around a bowl or plate to make a perfect circle. Place a uneven number of flowers on opposing sides. 5 flowers is enough, but you could make the whole wreath flowers if you want! Step 2: Paint the flowers first. Remember when I showed you how to paint roses? Choose a color like pink, mauve, maroon, or purple for the flowers to make a nice contrast to the green leaves (which we'll add later). I chose a darker purple for this tutorial, but I actually like the lighter, more transparent colors better. Just experiment like me to find out which colors suit you best. Step 3: Add a few buds. To even out the color around the wreath, add a few small buds here and there. Remember to keep it simple. 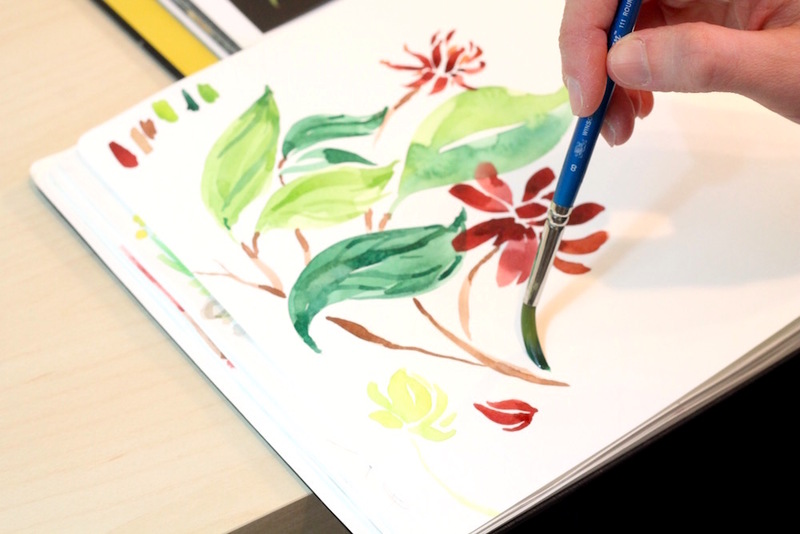 Your brush strokes should be light and easy. 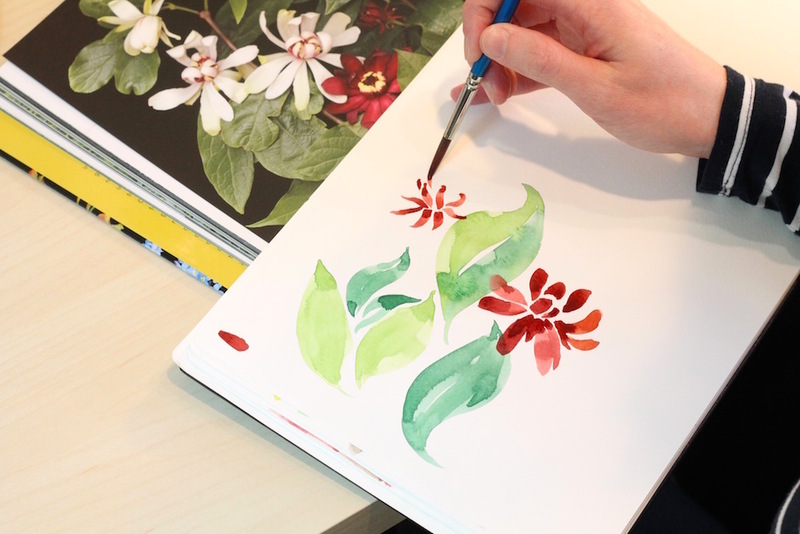 Try to paint the buds in two quick movements downward. Leave a white space for a highlight and space them apart unevenly. Step 4: Lay in the leaves. 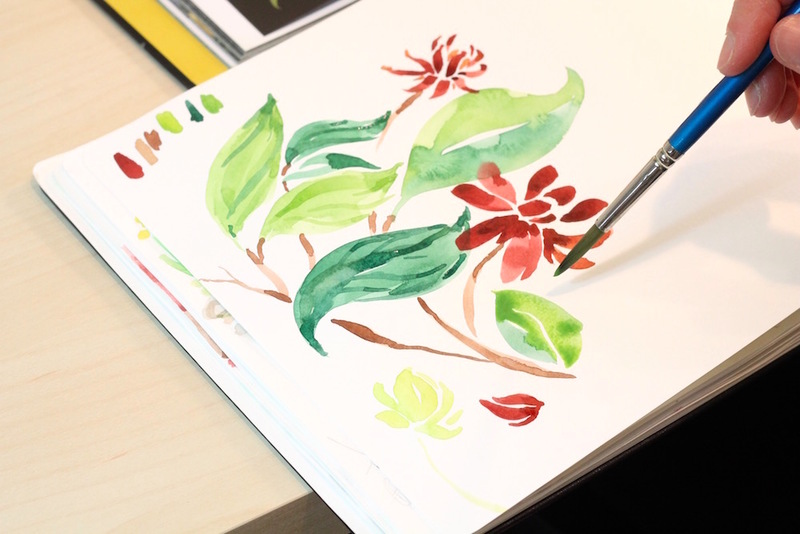 Remember when we talked about painting leaves? You may need to practice the different parts of this wreath on a separate sheet of paper while you build the wreath. Start with a blue for the bottom leaves, then slowly add more and more green. Keep all the leaves pointing in the same direction to add movement. Vary the size of the leaves and add a stem or a few stems twisting together as you work your way around. Remember that rose leaves have points around the edges. 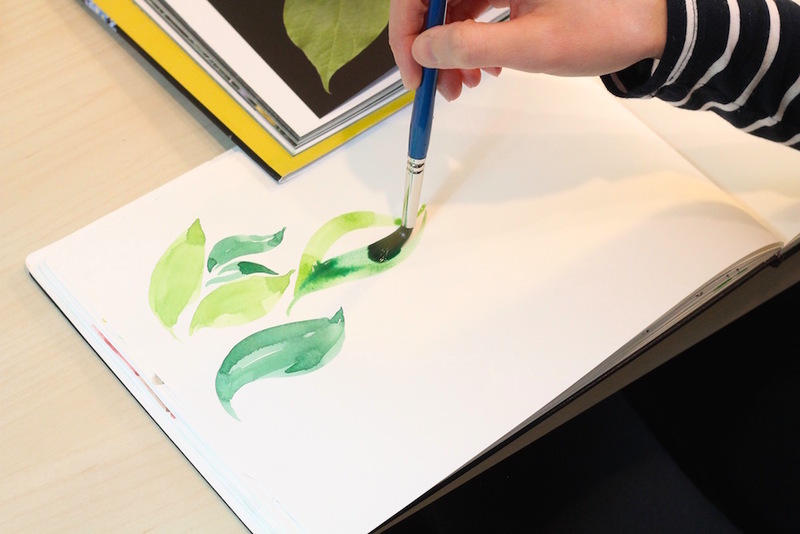 Feel free to add this feature to each leaf with a few simple and small strokes of green. 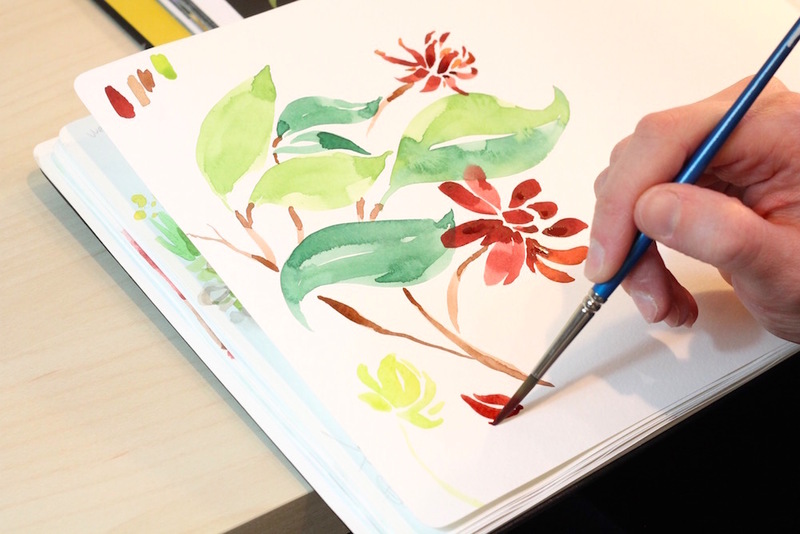 As you work your way around, adding leaves and details as you go, lighten the green and add more yellow so that each leaf is a slightly different shade of green. This color variation will make it look like the sun is shining on your wreath and illuminating the leaves on top while the ones on the bottom are shadowed. Here's a tip I always learn the hard way: Don't overdo it! See the wreath I painted in the center versus the ones on either side of it in the photo above? The one in the center is light and airy, not overdone. The other two were practice pieces that I don't like nearly as much. They're too busy! Try a wreath with only leaves and maybe one with only flowers. As usual, experiment and have fun! Add the name of your child and his/her birthdate or the names of you and your significant other to make this a cute Valentine's Day gift. I scanned my wreath and added the name digitally, but I'd encourage you to make it all by hand. Here's my tutorial on hand lettering to help you! I'm now offering this semi-custom print in my shop! Order the print as a Valentine's Day or Anniversary gift for your spouse, and I'll change the names and date to your own. So cute! 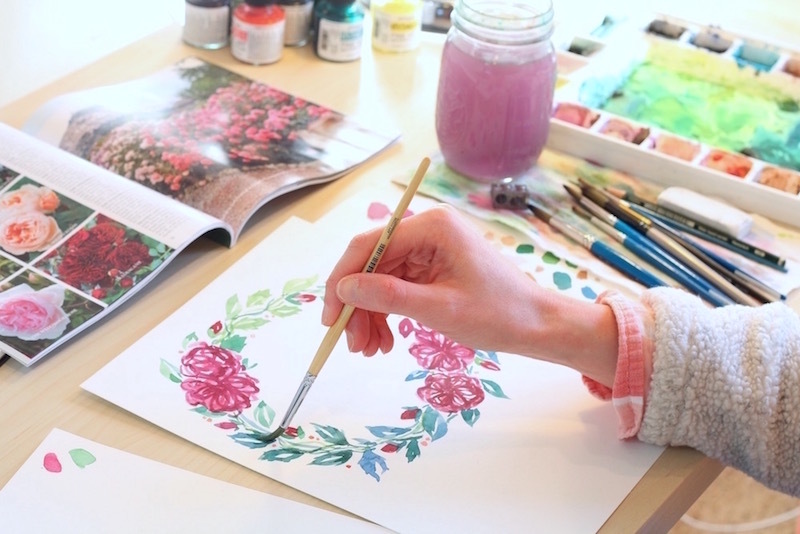 I'm so excited to share today's tutorial because roses are one of my all-time favorite flowers and are really fun to paint. Plus, next week I'm going to show you how to combine the last few tutorials to create a custom illustration for your hunny bunny for Valentine's Day. How fun is that?? 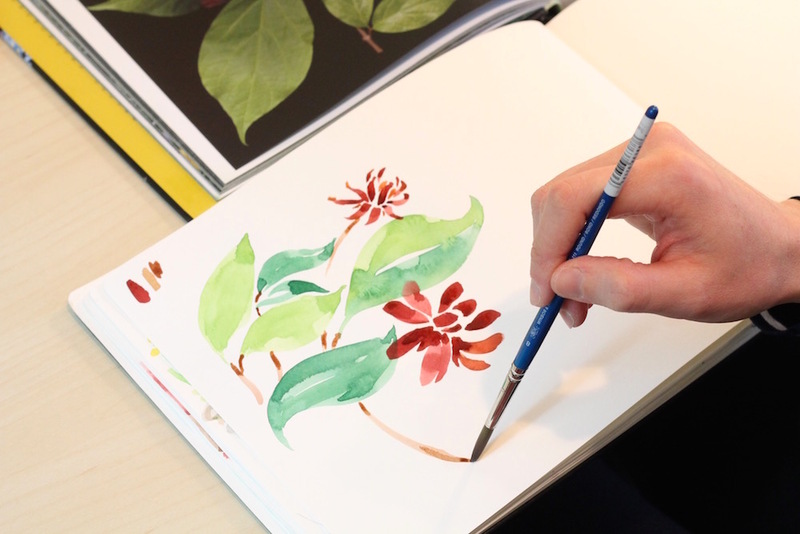 We'll be working in our watercolor moleskine sketchbooks again and using a large round brush size 16. Step 1: Start from the center and work your way out. In a circular motion working away from center, pull the brush around in a swirly motion, twisting the brush slightly, working slowly, and varying the pressure on the bristles to create a varied look. Go slow and practice this motion! Try to do it all without stopping or picking up your brush. Since rose petals are more compact toward the center of the flower, the petals there will be smaller. So use the tip of your brush to create thinner lines. You may want to drop a bit more color into the very center while the paint is still wet. Step 2. Rinse the brush and work outward. As you work your way outward, remember that the petals get lighter, so rinse the brush out slightly before moving on. 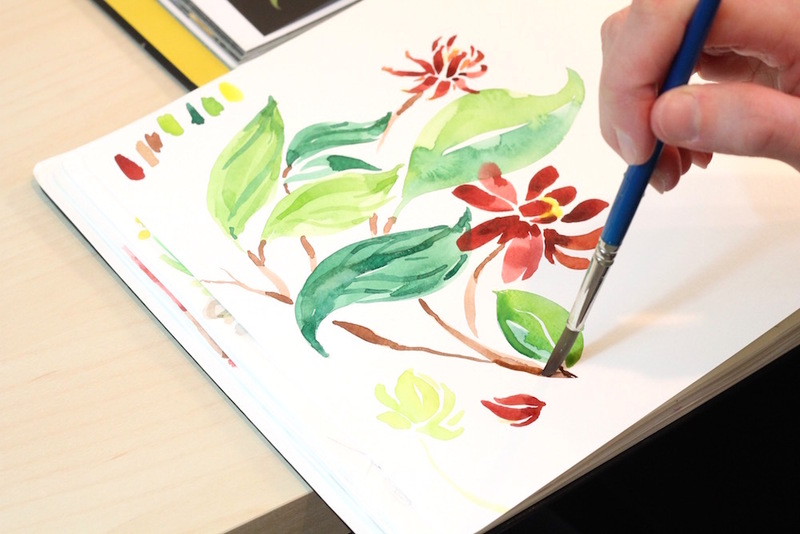 Start at the bottom edge of the swirly center you just created and, with a wet brush, use the side of the bristles to make a flatter, larger petal. Repeat that motion as you add petals around the center of the flower. Step 3: Rinse brush again and add a few thinner petals to the outer edge. You should now have a center surrounded by 3-4 larger petals to one side (bottom left or right). Rinse your brush and pick up a medium shade of pink from your palette. Add a few smaller petals to the sides and top of the center to make the rose look more full and in bloom. Blur your eyes and back away from the painting slightly to see where the rose might need more petals or be uneven. Step 4: Practice and paint lots of roses! 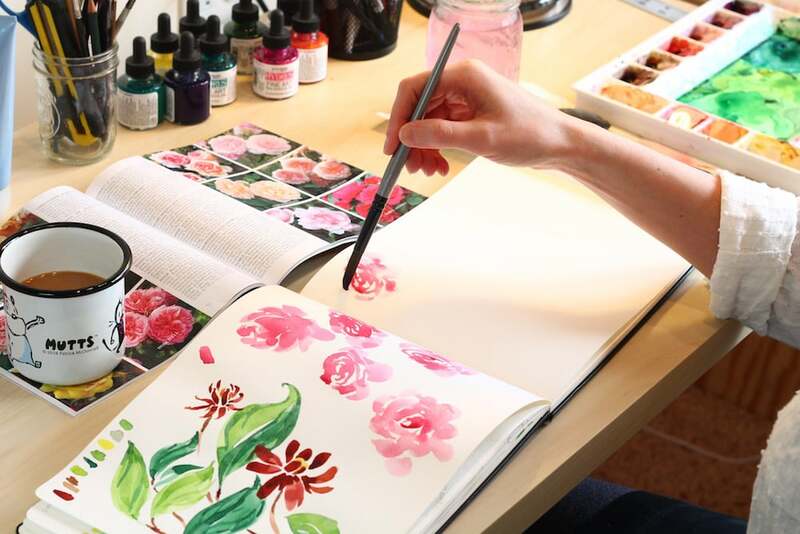 It takes lots of practice to know how many petals to add, how much color to load your brush with, and how to fade the petals from dark to light. So, work at a consistent pace and paint lots of flowers like I did! Don't be afraid to fill the entire page with roses. Don't forget to come back next Thursday for another tutorial! We'll be combining our skills to create super cute customizable floral wreaths. How fun!